Pastor Michael was born and raised in Freeport, IL, attending Concordia College in Seward, NE, receiving his degree in Elementary Education in 1998. After teaching middle school for two years in Columbus, NE and five years in Davenport, IA, he was called to help start the middle school and the athletic ministry at Grace Lutheran in 2005. In 2015, Pastor Michael was led to start the Specific Ministry Pastor program through Concordia Seminary – St. Louis to be the Associate Pastor of Grace overseeing family ministry in the church & school. 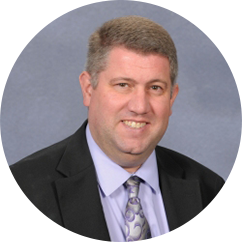 Pastor Mike is the Director of Athletic Ministries for the FLGA District and the president of the Jacksonville Christian Athletic League. He was married in 1998 to Grace’s 3rd grade teacher, Jessa, and they have two boys, Peyton (Grace graduate ’15) & Addison (Grace graduate “16). Pastor Michael loves coaching basketball and watching the Chicago Cubs, Bears, Bulls, & Blackhawks. Pastor Michael was born and raised in Freeport, IL, at-tending Concordia College in Seward, NE, receiving his degree in Elementary Education in 1998. After teaching middle school for two years in Columbus, NE and five years in Davenport, IA, he was called to help start.